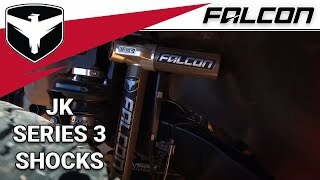 Falcon JK/JKU Series 3.2 Adjustable Piggyback Shock Absorbers feature a simplified eight-position Tool-Adjusted Micro Position Dial (Hex Adjuster Tool included) to fine tune damping for specific terrain and handling. The eight micro positions tune compression damping from soft to firm. This shock offers 80% of the adjustability of the Series 3.3 Fast Adjust model at a lower cost minus the convenience of the Fast Adjust Knob.